A member of the O-Ku family since 2010, executive chef Jordan Smith first began his journey with O-Ku Atlanta in December 2015 as a member of the opening team. Prior to his current role, Smith served as the concept’s sushi chef. Before relocating to join the Atlanta team, Smith served as the sous chef for O-Ku’s pioneer location in Charleston, during which time he represented the restaurant at the Lowcountry Food Bank’s annual Chefs’ Feast ultimately taking home the “Best of Charleston” award for sushi in 2012. 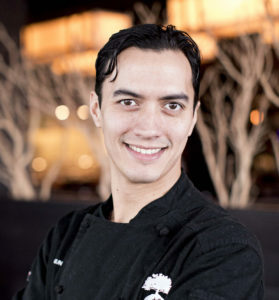 Prior to joining the Indigo Road family, Smith spent six years developing his Asian cooking techniques as a sushi and hibachi chef at Charleston’s award-winning Wasabi, followed by a stint as the oyster and raw bar chef at 39 Rue de Jean. A graduate of the Trident Culinary Institute, Smith mastered classic French cooking techniques before focusing his talents on Asian cuisine. He went on to study sushi preparation at Houston’s Uchi, as well as under O-Ku alumni Jackie Chang and Sean Park, the latter of whom trained under the lineage of Nobu. He has immersed himself in everything restaurant and hospitality for the last 16 years, crediting his mother’s Thai heritage and a lifetime of practicing martial arts for his love of Asian culture, cuisine and cooking techniques. Smith has also developed a deep respect for high quality raw and cooked seafood seleGive ctions, which he employs daily as he helms the kitchen at O-Ku Atlanta.